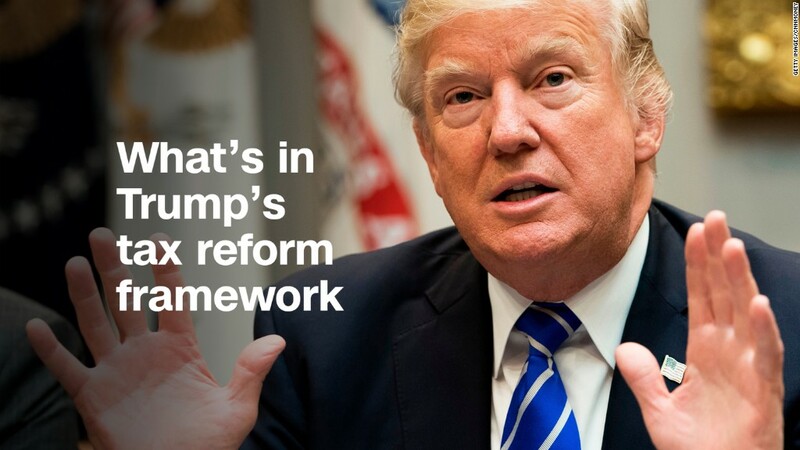 President Trump says the blueprint for tax reform he presented this week with top Republican lawmakers wouldn't help him at all. "I'm doing the right thing, and it's not good for me. Believe me," Trump said during a speech in Indianapolis on Wednesday. The president has never released his tax returns. So it's impossible to say exactly how the GOP plan would affect him. Besides, the details of tax reform still need to be written on Capitol Hill. But there's every reason to believe Trump and his children could benefit from four provisions in the framework. A few others, such as the repeal of many itemized deductions, may hurt them. The GOP framework would lower the top tax rate on the "business income of small and family-owned businesses ... to 25%." Today they pay a top rate of 39.6% on taxable profits over $418,400 ($470,700 if married). These so-called pass-through businesses include everything from Main Street shops to big accounting firms, medical practices, and private investment partnerships. They also happen to include many of the Trump family's vast financial portfolio -- from golf clubs to hotels to real estate developments to Trump-branded products and ventures. Pass-throughs are not taxed under the corporate code. Instead, their profits flow through to the owners, partners and shareholders, who then report and pay tax on them through their individual tax returns. The estate tax affects very, very few Americans. The Tax Policy Center estimates that this year only 11,310 estates will have to file a return, and just 5,460 of them will end up owing any federal tax after accounting for deductions and credits. Why? Because only those estates worth more than $5.49 million this year ($10.98 million for married couples) even have to file estate tax returns. Then only about half of those end up being taxable after factoring in deductions and credits. Given how wealthy the Trump family is, they would certainly benefit from a repeal as called for under the GOP framework. What's not clear is if lawmakers would also choose to take away a pretty sweet break for heirs, called a "step up in basis." It basically lets people inherit tax free any asset with untaxed capital gains. Here's how: Say you bought shares in a company eons ago for $50 a pop. You never sold them and bequeath them to your children. When you die, the shares are trading at $150, for a gain of $100 per share. That gain will be tax-free forever because when your kids inherit them, they get a "step up" in their capital gains basis to $150, meaning the only tax they'll owe is on the appreciation in price over $150 should they ever choose to sell the shares. The GOP framework would let businesses to fully and immediately write off the costs of their capital investments, other than "structures," for five years. That's more generous than current rules but likely won't benefit real estate investors who buy buildings (i.e., structures), said Steven Rosenthal, a tax lawyer and senior fellow at the Tax Policy Center. But Trump and his children could benefit under the proposal to the extent they have non-real estate businesses that purchase equipment and other deductible investments. Tax filers are supposed to pay whichever is higher: their tax bill under the rules of the regular tax code or under the rules of the AMT, which disallows various tax breaks. Normally very wealthy people like Trump aren't subject to the AMT because their tax liability ends up being higher under the regular code. But in Trump's case, based on what little is known of his taxes, he had to pay an additional $31 million on his 2005 return because of the AMT. That's most likely due to the outsized net operating loss ($916 million) that he reported in 1995 and was allowed to carry over from year to year. The AMT disallows some net operating losses. It's not known if Trump is still carrying such large losses. But if he is, a repeal of the AMT could further reduce his tax burden, Rosenthal said. In 2005, for instance, he would have had to pay only $5.3 million if it weren't for the AMT.